I'm going to preface my remarks by saying that I'm not sure if I'm going to say what I want to say here very well. Some points may be further clarified through comments and dialogue. I'm thinking as I type. I've sat on this book for a little while, not writing up my thoughts immediately upon finishing it as I usually do. I completed this read before Thanksgiving but am just now sitting down to write about it. 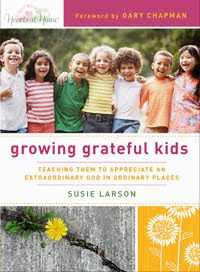 Originally I picked up Growing Grateful Kids , by Susie Larson because I thought it would be helpful in teaching our kids about how much they have in relation to others in the world and how we should be grateful as the title suggests, etc., etc. And while all of that is true I guess I must confess that I was looking to see if I'd be convicted to "go small" for Christmas instead of celebrate wildly like I'm rather inclined to do. I thought maybe Larson might convince me that I have too much, that my kids have too much and that we should drop Christmas and run to a third world country and -- well, you get the picture. 1. It is true that Americans do not live in third world conditions, despite the fact that many people in the U.S. think that they do. 2. It is true that certain Americans foster and promote a materialistic society. 3. It is true that my family has their needs met, materially speaking. 4. It is true that I like to celebrate life in many and various ways. 5. It is true that I know how to give good gifts to my children. 6. It is true that I think that it's ok to give good gifts to my children. 7. It is true that I love the holiday season. 8. It is true that I am a Christian. 10. It is true that we are to care for our neighbors and not put more emphasis on things than we do on Christ. 11. It is true that we don't know the exact date of Christ's birth. 12. It is true that Christmas has been commercialized and has become more "worldly." 13. It is true that anything good can be hijacked and spoiled by the world and therefore you should examine anything and everything in light of scriptures and make a determination of whether or not something is profitable (in the spiritual sense) for you to engage in. 14. It is also true that Christ WAS born here on earth and the church has put a fixed period of time on their calendar to observe this event, as well as the event of His death on the cross. 15. It is true that the world gave us the Easter Bunny but God still gave His son and I'm going to observe His act of sacrifice no matter what the world says or does at the same time. 16. And it's true that I'm not therefore going to be stickler about the unknown exact date of his birth but observe the fact that He had to be born in order to die. 17. It is very true that I celebrate Christmas - and that in a big way - and I've no apologies to offer for it. I hope I celebrate it more grandly and fully than the world does and that's pretty much all I have to say about that. In case you want to skip the rest of this (lengthy) post and just figure out what my conclusion was: it was to carry on as we always have, changing little-to-nothing as this book really had nothing to do with giving away all that we had in order to teach my children to be grateful. Larson proceeds to talk about the things that plague as as individuals, mothers and parents: fear, worry, anxiety, etc. She addresses those problem attitudes in our lives and calls us to look to Christ to look after us and meet our needs. The book is a walk of encouragement alongside someone who has faced her own life trials and who is here to assure you that God will never leave you or forsake you no matter what the circumstances might currently look like. In the midst of a painful trial it's easy to lose sight of the fact that God is good, always. However, if we are faithful to continually seek after Him, listen for His voice and obey His instructions then our children will see this faith and will feel safe and secure in Christ even during the darkest moments in our lives. She also spends time talking about how we are broken, sinful creatures ourselves, prone to mistakes. We cannot parent perfectly but we do have access to a God who delights to give His children wisdom as they face hard situations. I think that's a most important thing. Stuff isn't a source of happiness. It is a gift (yes, to be grateful for!) Stuff can certainly be exciting and can produce momentary glee. That's not bad in and of itself. We are allowed to have fun as Christians. We should be having fun as Christians. But if our ability to have fun ebbs and flows with the amount of things that we insist on surrounding ourselves with, then we have a problem. Stuff is fun, but it is very temporary and I think it is important to let the stuff go when and if it starts interfering with relationships with others (i.e., fighting over toys, being upset because you lent something out that was accidentally destroyed, etc.) or with our relationship with God. Relationships are the more important thing. They trump the stuff any old day of the week. Living that fact is very important. Teaching our children that fact is very important. It doesn't mean that stuff and celebration is bad. It just means that we need to keep our priorities straight and take the "stuff" for exactly what it is - gifts to be enjoyed along the way. "Stuff" is just a temporary pleasure that is not a sinful gift in and of itself, but "stuff" is also not what we build our happiness on. Our happiness can and is only to be found and maintained in a living, breathing, real-life relationship with Christ Jesus. I'll conclude with the idea that Larson expresses of living a bold faith in front of our children, concentrating on our own sins, confessing and rejoicing before young eyes and hearts so that they can more fully see Christ in our own lives. Instead of providing conviction that I was celebrating Christmas/the holidays inappropriately with my children, instead I was invited and encouraged to examine sinful attitudes, desires and actions within my own heart and life so that I could walk more whole heartedly in Christ. With an authentic faith mirrored for my children, I hope great things. My conclusion - at this time - for teaching children gratefulness during the holiday season is to continue on celebrating wildly, loving well and pointing our children to the Giver of All Good Things all the way. My conclusion - personally speaking - as a result of reading this book was that I have a lot of personal issues to work on and it's prideful and sinful of me to set about working on correcting only my children while having an attitude that I'm Just Alright myself. The Christian walk is a tough one. Much is required and the journey doesn't end until God calls me home. I've still much to learn. For the record, I'm very grateful for this book and the thoughts it provoked as I read through it. Yes, I do heartily recommend it! "We have this one life, this short time on earth to make our mark and to make life count. We have these children in our care for a blink of an eye. Now is the time to be engaged and fully present. Now is the time to seek divine insight into God's plan for their lives. Now is the time to rise up and be the parent that we might train our kids in the way they should go. I'm in the middle of this book too. I got it b/c I was seeing some character issues in my girls' heart and thought we should work on gratitude. After the first chapter, I told my husband (tongue-in-cheek), "If I'd known this book was about MY heart, I would never have opened it!" In just a few chapters, it has been convicting and has changed the way I speak to my girls all day long. Already, I see their words changing too. How right it feels to be walking through our days giving more verbal praise to our Creator. Wow! This sounds like one I NEED to read for my own edification! This hit me between the eyes: "We cannot grow beyond our ability to receive correction. Francis Frangipane"
I think I pretty much agree with everything I read here. It's a constant battle to remember as a parent to focus on the heart (mine as much as theirs) and on modeling the right attitudes rather than just on outward conformity. Wiggins - Definitely convicting and it could likely stand a re-read by me already. It's a Hearts at Home book and I'm wondering if I should explore more of their titles because this one was so spot on! Amy - Waa haa haa. Barbara H. - That one definitely got me. Correction is never easy to take but that simple sentence points out such a basic fact: refuse correction and you will not grow. Ouch! Yes! I completely agree. I wasn't expecting this book to be about ME! :) I checked it out from the library, but I think I need to purchase it so I can read it again. Sounds like a book I don't want to read...but NEED to read. I think I'd really like this book! I always struggle with just how big to go at Christmas. My side of the family has always been more conservative with Christmas buying, but my husband's side goes ALL out. It's tough finding a balance for us! I wasn't expecting to see a Francis Frangipane quote! He's an author I like (3 Battlegrounds) but few people have ever heard of. Sounds like it was a challenging read! Excellent discussion, Carrie. I totally agree that gratefulness and contentment are a year-round problem. Perhaps we have less of an issue being grateful during Christmas than we do when times are lean and tempers are short. I am reminded regularly that I need to practice gratefulness and contentment when it comes to non-material blessings as well. It's so easy to focus on what we do not have in relationships as well. Oops, almost forgot to mention my like of your 17 point reasoning regarding Christmas. It must the the Law School bleeding through. I love doing that sort of thing myself. I read about half this book and then got distracted by life. I keep trying to get back to it. I kinda felt the same way as you. I thought it would be full of practical ways I can instruct my children in gratefulness and being unselfish. But I found it really focuses on moms and that as we are grateful it naturally flows to our children. I don't think the title adequately describes the book but it is a good book for moms. I really must re-read it. Seriously, though, there were enough points of conviction even just in your review to make the book worth a purchase!